English artist and illustrator, famous for his covers of Grahame Greene novels of 1980’s. Hogarths love of travel led him to produce watercolours and drawings all around the world. As an illustrator he worked with a number of esteemed authors, Rupert Graves, Graham Greene, Laurence Durrell and William Golding. 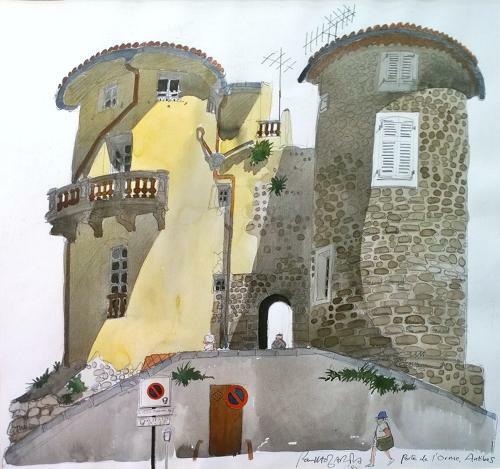 He fully illustrated Peter Males ‘A year in Provence’. He was elected ARA in 1974 and Royal Academician in 1984; this was followed by an OBE in 1989. His work is in collections worldwide and he regularly exhibited at the Frances Kyle Gallery in London.